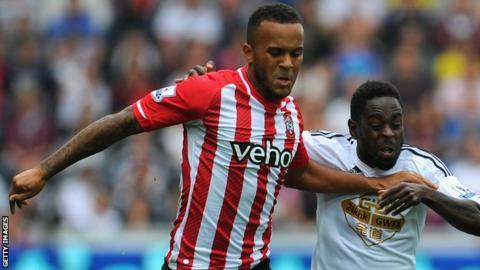 Ryan Bertrand says he is open to making his season-long loan switch to Southampton a permanent move. The left-back, 25, arrived from Chelsea on 30 July - the seventh time that he has left Stamford Bridge on loan. Bertrand, who has won two England caps, has helped Ronald Koeman's side to second place in the Premier League and would be happy to stay at St Mary's. "It is one of those things where I've got to wait and see, but, for me, there's no reason why not," he said. "There is a good base to the club, we're pulling in the right direction. We have fantastic fans, fantastic players, a fantastic manager and coaching staff. "It has been a good experience for me so far, so I don't see why not." Bertrand, who started for Chelsea when they beat Bayern Munich on penalties in the 2012 Champions League final, moved to Stamford Bridge from Gillingham in 2005. He has since been on loan to Bournemouth, Oldham Athletic, Norwich City, Reading, Nottingham Forest and Aston Villa. Speaking about his experience at Southampton, the defender added: "I am pleased with the way it has started but you know there is a lot more work to be done. "As a team we're only going to get better, individually I am only going to improve."